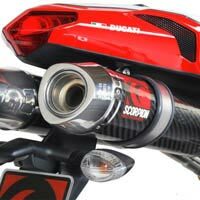 Scorpion Ducati Motorcycle hand built exhaust systems not only give real exclusivity, but added value too. When you upgrade to a Scorpion Exhaust system you are paying for quality R&D, the finest hand selected materials, extensive testing and for the skills of the best engineers in the industry. Ducati 1098S (2007 to 2009) Twin Scorpion Factory Oval Exhausts. OEM 'PLUS' Range aimed squarely at riders looking for all the performance benefits of a Scorpion upgrade.